Drill starts with players in positions marked. 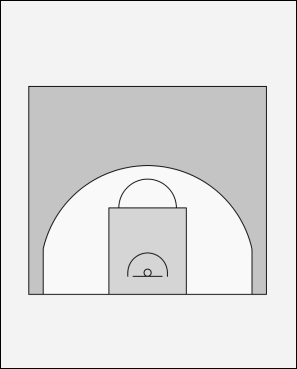 Player (4) dribbles to basket for lay-up. (4) takes the rebound, throws an outlet pass to (1) who skips pass across to (2). Each passer follows the ball. On (2) receiving ball, and NOT before, (5) makes a cut from the line. (2) makes chest pass to (3) who puts little bounce push pass into the cutter for the lay-up. Everyone follows his or her pass and you can see that as (3) passed to the cutter than he/she goes to the end of the cutters line. This is quite a simplistic drill but gets better as you add balls to the line. I have run this drill for 10 years and use 3 balls to keep everyone on their toes. Passing - outlet, skip (overhead), chest and push. Timing - the basis to any structured offense, the cutter does no leave until the strong side wing receives the ball. Conditioning - watch them run.